Ritesh Shah is a database professional with having 16+ years of experience in various domain of IT field. 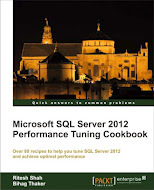 He is a author of many technical articles on Microsoft Technology and authored a book of SQL Server 2012 Performance Tuning cookbook. He loves work with different Microsoft Products. SQL Server blocked access to procedure ‘dbo.sp_send_dbmail’ of component ‘Database Mail XPs’ because this component is turned off as part of the security configuration for this server. A system administrator can enable the use of ‘Database Mail XPs’ by using sp_configure. For more information about enabling ‘Database Mail XPs’, see “Surface Area Configuration” in SQL Server Books Online. Well, by default, SMTP mail functionality comes disabled and if you intend to use it, you have to enable it with the help of SP_Configure system stored procedure. Here is the small TSQL snippet which helps you to enable database mail functionality. Once you execute above given TSQL Snippet, you can use database mail functionality. This entry was posted in Database mail XPs, SP_Configure and tagged Database Mail XPs, sp_configure on April 4, 2013 by Riteshshah. Each side of a Service Broker conversation is represented by a conversation endpoint and sys.conversation_endpoints catalog view contains a row per conversation endpoint in the database. Generally when service broker accept record in message queue, it used to process message and remove it after closing by its own. Recently at one of client site I have seen that messages are having “CD” state in sys.conversation_endpoints catalog view but it is not being removed from the message queue. Message queue was having approx half a million message with “CD” closed state so in order to remove those messages, I have created one small script to clean it up which might be helpful for you as well sometime. After having the above stored procedure, you can run it and clear all conversation which are already closed. Generally message should be closed and removed by its own but once in a blue moon if you come across the situation which I have observed at my client site, you can use this SP. This entry was posted in Service Broker and tagged Closed Conversation, Service Broker, SQL Server, State CD on April 3, 2013 by Riteshshah. We have very large setup of Service Broker enabled in our live databases. Out of which, some of the nightly business processes create a huge target queue which we suppose to finish during the night time itself. If we can’t cleanup all these queue in night time, it creates additional overhead during the day time when most of the customer uses our SaaS product which we can’t afford. This is the reason I am using one very small script which gives me approximate (not exact) idea about how much time current queue will take to complete. If it is taking longer time then I can increase the threads to process it faster to get it done in night time. BTW, one needs to keep watch on locking if threads are blocking each other, you won’t get much benefit of increasing threads. Note: I am using one user defined function “GetQueueCount” in the script below so if you don’t have function “GetQueueCount” than kindly create it first. Now, you can execute this stored procedure to see how much time would it take to complete the queue. If queue is processing and it is also getting new records at the same time, you might not have exact value. This entry was posted in Service Broker, sql server and tagged Queue Count, Queue Delay, Service Broker on April 2, 2013 by Riteshshah. This post is 504th post in my blog. I have started sharing my knowledge in form of blog article three years back. Initially I, just, wanted to keep my script collection online so that I can find it easily as and when I need it but later on my blog has gained overwhelming response from the community. I have started my blogging journey with “SQLHub.com” which was focusing on relational database only but later one I think to go beyond relational database and hence I have booked another domain, named “Extreme-Advice.com”. I have started writing articles in “Extreme-Advice.com” 5 months back only. 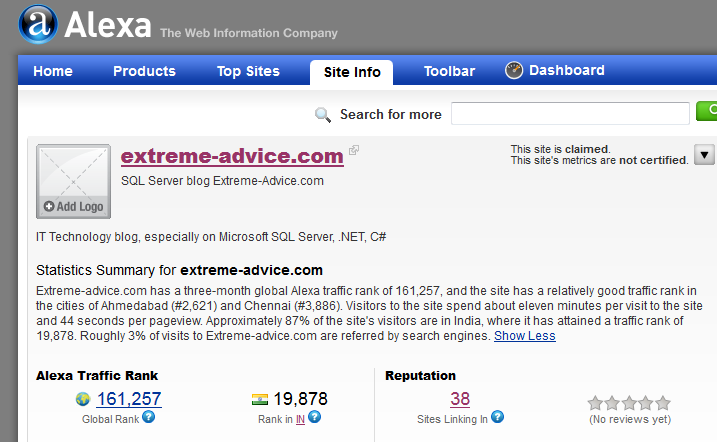 As soon as I have started “Extreme-Advice.com”, I found I had Alexa rank 1.8+ million world wide and 100K + in India but due to overwhelming response from the reader, I have reached to 19K+ rank in India and 160K+ world wide. I don’t like to measure my blog performance by rank or by the hit I used to get. I would always like to know how many people I have helped so far and each email from the reader motivate me to work even harder as a blogger. Whatever script I develop for my need, I used to share it with my blog reader. I share, mostly, those script which I use myself but out of all scripts some of the scripts are very useful and I would like to keep it handy so that I can easily find it out. Herewith, I am proving bookmark of those script and I hope you too find it useful and keep it handy, you never know, when shall you need it!!! This entry was posted in sql server and tagged milestone, SQL Server on March 30, 2013 by Riteshshah. Recently I had one article which shows how to update XML attribute value which doesn’t had any checking/condition while update. One of the reader asked me how can he update value based on condition. Here is the solution for it. Now we will change attribute “Dept”’s value from “VOC” to appropriate value. Let us now execute SELECT statement on Orders table to confirm that whether we have new valie in attribute “Dept” added inside “Test” element or not? This entry was posted in sql server, XML, XQUERY and tagged SQL Server, xml, XQUERY on March 29, 2013 by Riteshshah. While managing multiple instance of SQL Server, it is little bit difficult to keep watch on every jobs running in every SQL Server Instances we are managing. I have created one monitoring application which suppose to be watched by at least one DBA 24*7. I have one section of “Missing Job” in my monitoring application so that whenever any job failed the schedule, one of the DBA get an alert and s/he can do needful. Following is the TSQL script which I use to find missing job. This entry was posted in JOB, Missing Job, sql server and tagged JOB, Missing Job, SQL Server Agent on March 28, 2013 by Riteshshah. Recently I have written article on Inserting attribute in existing XML Elements and Delete XML element. Today I am going to show how to update existing attribute value in XML elements. While making an initial entry of DEPT, I have provided “VOC” but now I felt I was wrong and I have to put “SVOC” instead of “VOC” and in this case I have to update existing value of “Dept” attribute. Here is the script which I would use to update attribute value without any checking/condition. This entry was posted in sql server, XML, XQUERY and tagged Update XML attribute, xml, XQUERY on March 27, 2013 by Riteshshah. Use of XML is being popular in SQL Server and it comes handy in many situation as I have explained in many of my past Xquery/XML related article. Today I come up with one more example which shows usage of XQuery to insert element from XML data. Each test (i.e. : Voc MS Group1, SVOC Full) has one department which is not mentioned as an attribute in TestDetails node. Let us insert “Dept” attribute. Let us now execute SELECT statement on Orders table to confirm that whether we have new attribute “Dept” added in “Test” element or not? This entry was posted in sql server, XML, XQUERY and tagged Insert Attribute, xml, XQUERY on March 26, 2013 by Riteshshah. Use of XML is being popular in SQL Server and it comes handy in many situation as I have explained in many of my past Xquery/XML related article. Today I come up with one more example which shows usage of XQuery to delete element from XML data based on the condition you have. We can see that we have “TestDetails” as a root element in above given XML along with child elements “Test”. Suppose we have requirement to delete all elements which has test name “Pesticide Group1”, how can we do it with the help of XQuery? This entry was posted in sql server, XML, XQUERY and tagged Delete Element in XML, SQL Server, xml, XQUERY on March 23, 2013 by Riteshshah. Xquery is one of the wonderful feature I appreciate most in SQL Server. Due to lack of knowledge, people doesn’t tend to use it. I always prefer XML in case of I have to pass multiple values in one parameter of stored procedure. It is even useful many time to store XML value along with our relational data in SQL Server table. I, personally, prefer it while capturing and storing performance related data. Recently I have received on question in my facebook page where one member has shown me one table structure and ask how he can use XML data in WHERE clause of SELECT statement. This entry was posted in sql server, XML, XQUERY and tagged WHERE in XML column, xml, XQUERY on March 21, 2013 by Riteshshah.